Using the Goalseek tool for goal setting and scenario analysis in Fathom. The Goalseek tool helps to answer the question, "How do we get there?". This scenario analysis tool helps to design strategies to achieve a desired outcome. It also helps to identify the sensitivity, or importance, of key business drivers in achieving a given performance goal. Change one or many drivers to achieve a goal (either by using the slider or by entering a change value). To use the slider, drag the white button located below the 0% marker. The value listed under the 'To achieve goal' column represent a mutually exclusive change amount that is required to achieve the desired goal. In other words, if you were to drag the slider all the way to that amount, you would achieve your goal. Tip: If you anticipate that an increase in price will cause a reduction in sales volume, then increase price by X% and then move the slider for sale volume to a negative change % value. This will be represented by a red indicator on the volume slider. The impact of this will be represented on the progress bar by a reduction in the KPI starting value. 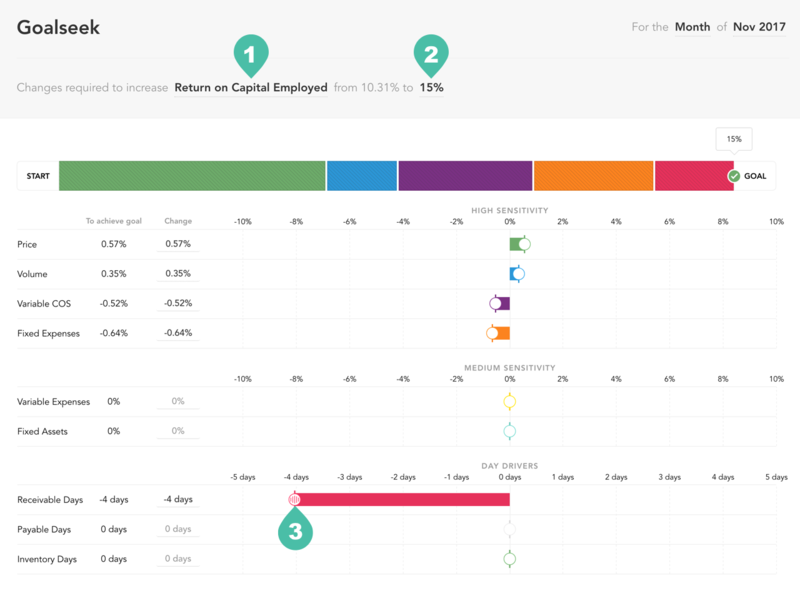 At the top of the tool you can choose to view results for any month, quarter or year. You can also view results for quarter-to-date (QTD) or year-to-date (YTD) periods, and select the ending month for these periods. You can save your Goalseek strategy as a PDF report by clicking the download icon in the sidebar, at the bottom left of the screen. How can reducing price and/or volume result in a increase in cashflow? In some cases, a reduction in revenue will result in positive cash flow outcomes. A reduction in price, may cause a reduction in Accounts Receivable, which could improve Operating Cash Flow. A reduction in sales volume, may be accompanied by a reduction in Cost of Sales, which could cause a reduction in Accounts Payable. In this scenario it is also helpful to understand the 'Cash Conversion Cycle' KPI along with the key working capital drivers (ie. Inventory days, Work in Progress Days, Accounts Payable Days and Accounts Receivable Days). 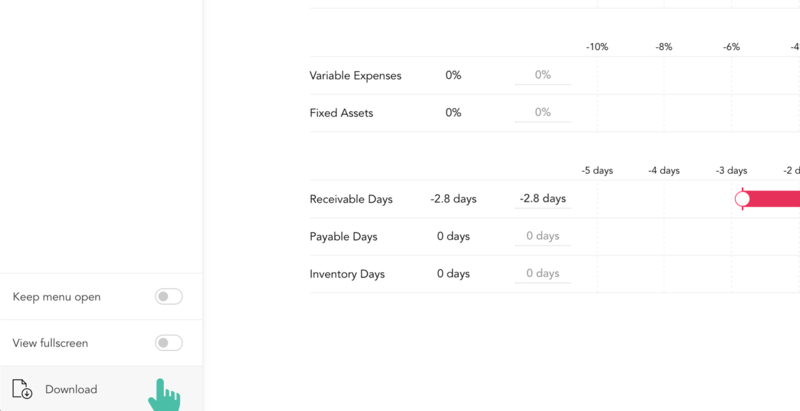 This KPI helps to track the time between the purchase of inventory and the receipt of cash from accounts receivable. Also the 'Net Variable Cash Flow' KPI is useful for identifying if the next $1 of sales will either generate or absorb cash.